The answers that follow represent those that may have been formulated by the end of the programme, accepting that there was some iteration between the systems, design and risk elements of the work. They are nonetheless representative of the systems approach originally applied to the challenge of improving the safety of patients using oral methotrexate for the treatment of rheumatoid arthritis. In 2000, a Cambridgeshire patient died as a direct result of failures in their care and treatment. The inquiry into their death highlighted the need to review the use of oral methotrexate for the treatment of rheumatoid arthritis in the UK. In this particular case, the patient had been taking a weekly dose of methotrexate for rheumatoid arthritis. The strength of methotrexate had been altered in error by her GP to a daily dose of 10 mg from the previous weekly dose of 17.5 mg. This was dispensed by a community pharmacy. The patient inadvertently overdosed on methotrexate and their immune system became severely compromised. The patient was later admitted to hospital with symptoms of a severe sore throat, where they continued to receive treatment at this high daily dose until the mistake was identified on the fourth day following admission. Of the 13,000 medicines licensed for use in the UK at that time, oral methotrexate was one of only six that should have been taken weekly. Previously, 25 deaths and 26 cases of serious harm had been attributed to the incorrect use of methotrexate. More than half of the 167 adverse events associated with patients taking methotrexate between 1993 and 2002 were the result of the drug being prescribed on a daily basis. Some cases were due to errors occurring during the transfer of information from hospitals to GPs, others were due to problems with information technology systems that failed to give clear information on the frequency of dosing. People who are actively ‘using’ the system are those within the Shared Care Arrangement (Figure 9), such as patients with rheumatoid arthritis, their carers, GPs, pharmacists, phlebotomists and hospital doctors. 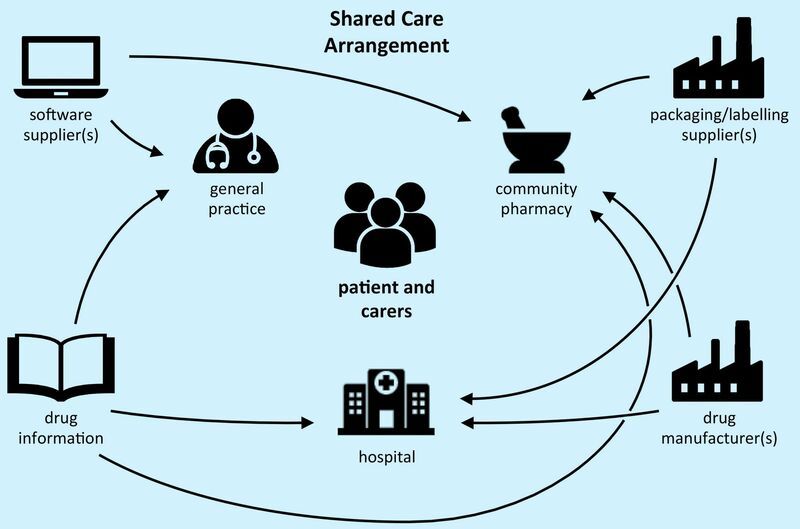 The system is in the UK and spans from the home to general practice to the community pharmacy to the hospital, working under a shared care arrangement (Figure 9). There are three suppliers of methotrexate for the UK market. They provide 2.5 mg and 10 mg tablets that are similar in colour and size in 100 tablet bottles and 2.5 mg tablets in blister packs of 28 tablets. information providers and packaging designers. I do not suffer adverse effects from the drug. so that there is no chance of the patient taking the wrong dose, and I need to ensure that the patient’s bloods are monitored so that the dose can be controlled. I need to understand the particular challenges of oral methotrexate use so that I am able to recognise the needs and potential problems experienced by these patients. I need to identify patients who might benefit from the use of oral methotrexate so that their quality of life can be improved, and I need to determine the most appropriate dose of oral methotrexate for the patient so that their condition may be improved. I need to dispense methotrexate in a timely way so that the patient always has the medication they need, and I need to ensure that the patient understands the particular restrictions on the use of oral methotrexate so that they are kept safe. I need to know that the patient understands the importance of taking the correct dose of methotrexate so that they remain safe, and I need to be sure that methotrexate is not confused with other medications so that they remain safe. I need to collect blood samples from the patient so that methotrexate toxicity tests can be carried out in the hospital. I need to ensure that any change to the methotrexate dose is communicated to the patient and GP so that they are both informed of the new dose. I need good blood samples so that I can test methotrexate levels in the patient’s blood. I need to deliver competitive prescribing and dispensing systems so that GPs/pharmacists use my software, and I need to ensure that my products enhance GP/pharmacist practices so that errors are reduced. I need to ensure that information is trustworthy and accessible so that GPs/pharmacists use my services, and I need to ensure that my services enhance GP/pharmacist practices so that errors are reduced. I need to provide clear identification so that the pharmacist and patient can unambiguously select the correct medication. I need to ensure that repeat prescription forms are authorised so that patients receive their prescriptions in a timely manner. I need to ensure that everyone is aware of our policies and practice relating to methotrexate so that patients receive safe care. Success will be measured by a significant reduction of deaths and serious injury to patients being treated with methotrexate for rheumatoid arthritis while maintaining the benefits of disease and symptom control. The management of patients taking methotrexate is organised using a Shared Care Arrangement, sharing responsibility for safe care between the general practice, the community pharmacy and the hospital. This forms the core of the system. In addition, computer software enabling the prescribing and dispensing of methotrexate is used, drug information leaflets and record books are provided, and the drug and packaging are required (Figure 9). Methotrexate used for the treatment of patients with rheumatoid arthritis is administered and controlled in the UK using a shared care arrangement, involving GPs, community pharmacies and hospitals. Other organisations supply the drug, packaging and labelling, prescribing and dispensing software, and drug information. The needs for redesign of the system are dominated by the needs of the patient, where the priority is for an easy-to-follow medication management process, easy-to-understand information about methotrexate, easy-to-identify medication and easy-to-open packs. Other needs, derived from the stakeholders list, should also be considered in the context of meeting the fundamental patient needs. Better information for the patient prior to treatment and use of patient-held records to include monitoring schedules and results. Clear branding of methotrexate as a weekly medication with clear instructions to take methotrexate on Mondays. Improved warnings and flags for GP prescribing and pharmacy dispensing software systems which were not easily over-ridden. Reshaped tablets from manufacturers to ensure that 2.5 mg round tablets are easily distinguishable from ‘new’ 10 mg torpedo shaped tablets. Repackaged tablets using novel designs and in reduced quantities so that the patient receives the original manufacturers pack. A new information leaflet for patients, emphasising the weekly dose for methotrexate, was drafted and trialled. This led to the provision of a methotrexate treatment guide incorporating a pre-treatment leaflet, designed to provide patients with guidance on low dose methotrexate, and a blood monitoring and dosage record booklet. The changes proposed for the shape of the methotrexate tablets were delivered, but this did not address potential confusion with other medications and, in particular, folic acid which is often prescribed along with methotrexate. Software vendors provided enhancements to their existing GP prescribing software to ensure methotrexate was clearly labelled as ‘High Alert’, ‘Alert’ or ‘Toxic’ in the drug list, to generate an additional alert message when selecting methotrexate highlighting the need for weekly doses and to provide dosing options that clearly articulated the number of tablets to be taken. Novel packaging designs were not pursued at this stage. However, manufacturers began to provide tablets in 16 and 24 packs with improved design (for patients with reduced manual dexterity), labelling and safety information. The use of existing pharmacy labels continued. Failure to identify changed prescription request arising from blood test results. GP prescribes methotrexate “as directed”. Patient receives wrong dose due to confusion between different strengths of methotrexate tablets. Patient receives wrong dose due to confusion between folic acid and methotrexate tablets. Patient experiences difficulties reading print on blister pack. Incorrect prescription of methotrexate is dispensed to the patient because of poor design of prescribing/dispensing software. Pharmacy picking error results in wrong medications being dispensed. Pharmacist only writes total dose of methotrexate, not number of tablets. Poor hospital drug chart review by hospital pharmacy. Many of these issues were addressed by the design changes proposed and other patient safety initiatives. However, a number remained, including the potential for patients to be confused by the two strengths of methotrexate tablets and this led directly to the policy in many regions to prescribe only 2.5 mg tablets. There was also a danger that patients might be confused by the variation in dose that was the direct result of the review of regular blood tests designed to determine the optimal dose for each individual. It was important that changes in dose were communicated clearly to the patient and others in the shared care arrangement to ensure that all patient records were up to date. Limited data was collected to enable direct comparison with previous error rates and subsequent patient harm resulting from use of oral methotrexate. Communications from the NPSA suggested that early compliance with new guidance  remained poor, likely contributing to ongoing errors in the use of methotrexate, resulting in patient harm. Eighteen months after the shape of the 10 mg methotrexate tablet was changed the Medical and Healthcare Products Regulatory Agency (MHRA) issued a Class 3 Medicines Recall. Original round 10 mg tablets that had remained in circulation alongside the new torpedo shaped 10 mg tablets were recalled as their continued presence had given rise to confusion where patients had been told all round tablets were 2.5 mg. Despite all the best efforts of the improvement team, methotrexate remains a potentially harmful drug that is ultimately administered by the patient. Deaths and serious harm continued at a lower level and in 2011 a patient, prescribed an increasing dose of methotrexate in order to identify the required level of medication, continued to increase the weekly dose beyond the mandated maximum and died. This was not an error that had been predicted and shows the importance of shared care arrangement team taking full responsibility for all aspects of the prescribing, dispensing and monitoring cycle when working with patients receiving oral methotrexate. The use of oral methotrexate as a treatment for rheumatoid arthritis relies on a number of systems working with the patient to ensure their safety. Further improvements in the use of this drug will need to follow a systems approach to ensure that key stakeholders work together to identify and implement changes that would minimise future loss of life. An inquiry into the death of a Cambridgeshire Patient in April 2000. Cambridgeshire Health Authority, 2000. Towards the safer use of oral methotrexate. UK National Patient Safety Agency, London, 2004. Patient Safety Alert – Reducing the harm caused by oral methotrexate. UK National Patient Safety Agency, London, 2004. Methotrexate treatment. UK National Patient Safety Agency, London, 2006. Products Regulatory Agency, London, 2004.